I have written a bit about boom, bust and bubbles recently. Not because I think we are heading for a new bubble – I think we are far from that – but because I am trying to explain why bubbles emerge and what role monetary policy plays in these bubbles. Furthermore, I have tried to demonstrate that my decomposition of inflation between supply inflation and demand inflation based on an Quasi-Real Price Index is useful in spotting bubbles and as a guide for monetary policy. For the fun of it I have tried to look at what role “relative inflation” played in the run up to the Asian crisis in 1997. We can define “relative inflation” as situation where headline inflation is kept down by a positive supply shock (supply deflation), which “allow” the monetary authorities to pursue a easy monetary policies that spurs demand inflation. Thailand was the first country to be hit by the crisis in 1997 where the country was forced to give up it’s fixed exchange rate policy. As the graph below shows the risks of boom-bust would have been clearly visible if one had observed the relative inflation in Thailand in the years just prior to the crisis. When Prem Tinsulanonda became Thai Prime Minister in 1980 he started to implement economic reforms and most importantly he opened the Thai economy to trade and investments. That undoubtedly had a positive effect on the supply side of the Thai economy. This is quite visible in the decomposition of the inflation. From around 1987 to 1995 Thailand experience very significant supply deflation. Hence, if the Thai central bank had pursued a nominal income target or a Selgin style productivity norm then inflation would have been significantly lower than was the case. Thailand, however, had a fixed exchange rate policy and that meant that the supply deflation was “counteracted” by a significant increase in demand inflation in the 10 years prior to the crisis in 1997. In my view this overly loose monetary policy was at the core of the Thai boom, but why did investors not react to the strongly inflationary pressures earlier? As I have argued earlier loose monetary policy on its own is probably not enough to create bubbles and other factors need to be in play as well – most notably the moral hazard. Few people remember it today, but the Thai devaluation in 1997 was not completely unexpected. In fact in the years ahead of the ’97-devaluation there had been considerably worries expressed by international investors about the bubble signs in the Thai economy. However, the majority of investors decided – rightly or wrongly – ignore or downplay these risks and that might be due to moral hazard. Robert Hetzel has suggested that the US bailout of Mexico after the so-called Tequila crisis of 1994 might have convinced investors that the US and the IMF would come to the rescue of key US allies if they where to get into economic troubles. Thailand then and now undoubtedly is a key US ally in South East Asia. What comes after the bust? One thing is how to react to the bubble bursting – another thing is, however, to avoid the bubble in the first place. 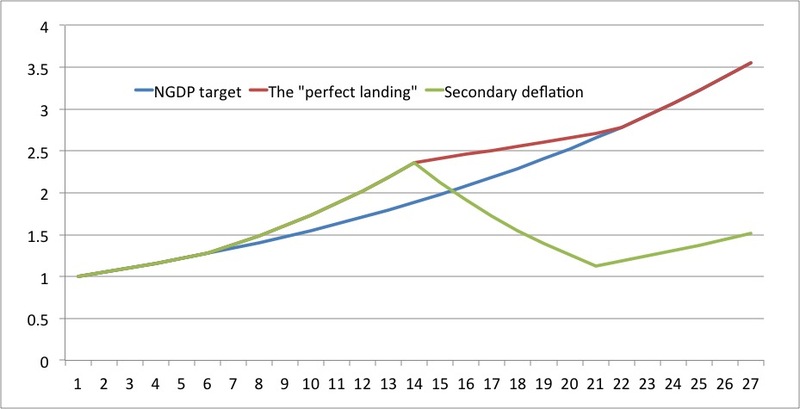 Market Monetarists in favour NGDP level targeting and at the moment Market Monetarists are often seen to be in favour of easier monetary policy (at least for the US and the euro zone). However, what would have happened if Thailand had had a NGDP level-targeting regime in place when the bubble started to get out of hand in 1988 instead of the fixed exchange rate regime? The graph below illustrates this. I have assumed that the Thailand central bank had targeted a NGDP growth path level of 10% (5% inflation + 5% RGDP growth). This was more or less the NGDP growth in from 1980 to 1987. The graph shows that the actually NGDP level increased well above the “target” in 1988-1989. Under a NGDP target rule the Thai central bank would have tightened monetary policy significantly in 1988, but given the fixed exchange rate policy the central bank did not curb the “automatic” monetary easing that followed from the combination of the pegged exchange rate policy and the positive supply shocks. The graph also show that had the NGDP target been in place when the crisis hit then NGDP would have been allowed to drop more or less in line with what we actually saw. Since 2001-2 Thai NGDP has been more or less back to the pre-crisis NGDP trend. In that sense one can say that the Thai monetary policy response to the crisis was better than was the case in the US and the euro zone after 2008 – NGDP never dropped below the pre-boom trend. That said, the bubble had been rather extreme with the NGDP level rising to more than 40% above the assumed “target” in 1996 and as a result the “necessary” NGDP was very large. That said, the NGDP “gap” would never have become this large if there had been a NGDP target in place to begin with. My conclusion is that NGDP targeting is not a policy only for crisis, but it is certainly also a policy that significantly reduces the risk of bubbles. 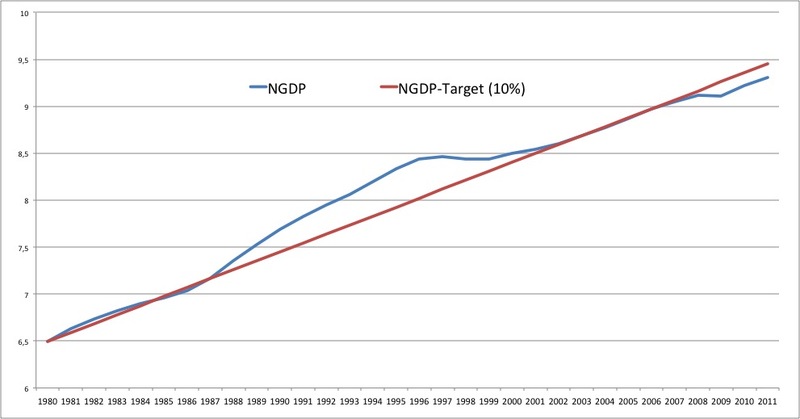 So when some argue that NGDP targeting increases the risks of bubble the answer from Market Monetarists must be that we likely would not have seen a Thai boom-bust if the Thai central bank had had NGDP target in the 1990s. It is often being argued that the global economy is heading for a “New Normal” – a period of low trend-growth – caused by a “balance sheet” recession as the world goes through a necessary deleveraging. I am very sceptical about this and have commented on it before and I think that Thai experience shows pretty clearly that we a long-term balance sheet recession will have to follow after a bubble comes to an end. Hence, even though we saw significant demand deflation in Thailand after the bubble busted NGDP never fell below the pre-boom NGDP trend. This is pretty remarkable when the situation is compared to what we saw in Europe and the US in 2008-9 where NGDP was allowed to drop well below the early trend and in that regard it should be noted that Thai boom was far more extreme that was the case in the US or Europe for that matter.